The "Monitor" was developed to fill the need for a low cost, quick and easy way to replace an obsolete or worn out "pump per point" lubrication system and or as a completely self contained, easily installed unit for OEM or new installations. The MONITOR can be shipped within 24 hours from our Bakersfield California Warehouse. The standard MONITOR VRUL was especially designed for use on rotary cylinder vapor recovery units. 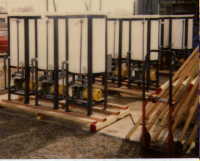 It comes with a 15 gallon drum type tank with site gauge and valve, a spin on 10 micron filter feeding the pump, a manifold incorporating a pressure gauge and rupture disc, a Lube Sentry flow switch, 7 point Trabon divider valve providing an equal positive distribution of the oil with performance indicators used to identify individual line blockage, a "no weep" cycle indicator and tube fittings. The pump is mounted in a sealed pan type base and an optional full containment basin is available. Its low cost and complete. All that you provide is the tubing, electrical hook ups for the pump motor and flow switch and your in business. Best of all the "MONITOR" can be customized to be suitable for almost any application, just give us a call with your requirements @ 1-800-494-3733 and we will do the rest. Special Single point units being crated for shipment. Plastic Tanks, Emersion heaters, Special Pumps. Let us know what you require and we will build it.